Animal staff at Paignton Zoo struggling to x-ray some hefty giant tortoises have turned the tables on their patients – literally. The female Aldabra giant tortoises weigh the best part of 14 stones – 90 kilos - and it takes four people to lift them. The males weigh even more. 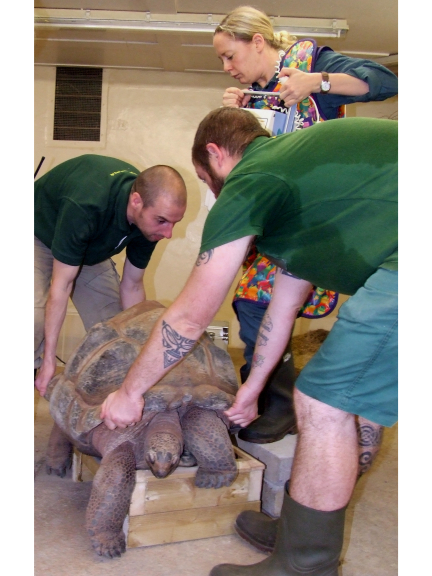 Don devised the sturdy wooden frame; the tortoises are lifted onto it and there is even a slot into which the vets can slide the x-ray plate. A member of the vet team then stands above the animal with the Zoo’s mobile x-ray machine and takes the x-ray from above. Celine again: “The table means they are lifted off the ground for only a moment or two, they can’t wander off as they are unable to reach the ground with their toes, and the x-ray is taken in a quarter of the time it used to take, especially good as previously we had to have another person in the room to restrain the tortoise and although everyone is wearing lead aprons, it’s still a radiation exposure risk. Paignton Zoo’s Aldabra giant tortoises were rather smaller when they arrived at the Zoo in 1986 after being confiscated from an illegal shipment by Customs & Excise. Paignton Zoo Environmental Park is a registered charity. For more information go to www.paigntonzoo.org.uk or ring 01803 697500.